Food Network and Allrecipes.com both offer sauce recipes to pair with meatballs. 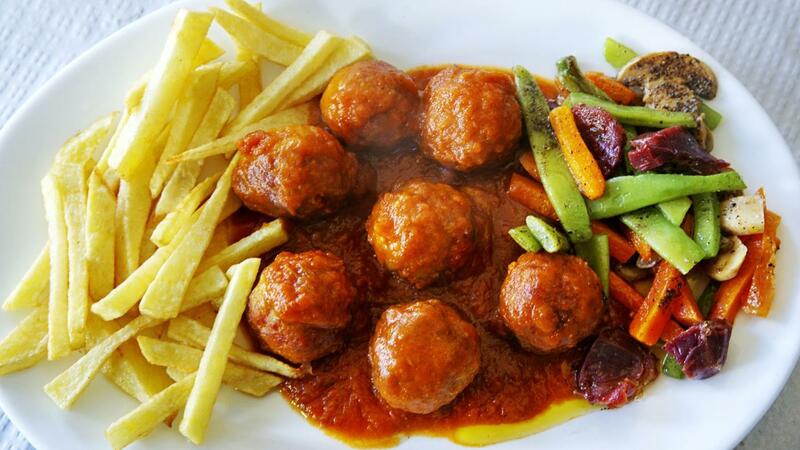 Both sites also provide a recipe for meatballs to serve with the sauce. Food Network separates the directions for the meatballs and sauce, making it easier to only make the sauce portion of the recipe. The Food Network recipe calls for straining two 35-ounce cans of plum tomatoes in a strainer while breaking the tomatoes up. Add four cloves chopped garlic, one medium chopped onion, 1/4 teaspoon red pepper flakes and 1/2 teaspoon pepper to 1/4 cup extra-virgin olive oil heated over medium-high heat in a large pot. Sauté about five minutes, then add the tomatoes, 1/2 cup red wine, 1/2 cup grated Parmesan cheese and 1 teaspoon salt. Add in one 6-ounce can of tomato paste and 1 cup of water. Once the meatballs are ready, add to the sauce, bring the sauce to a boil, then simmer for two hours. The Allrecipes.com recipe starts with sautéing 3/4 cup chopped onion and five cloves minced garlic in 1/4 cup olive oil in a large saucepan over medium heat until the onion is translucent. Stir in two 28-ounce cans whole, peeled tomatoes, 2 teaspoons salt, 1 teaspoon sugar and one bay leaf. Cover, reduce heat and simmer for 90 minutes. Stir in one 6-ounce can tomato paste, 3/4 teaspoon dried basil and 1/2 teaspoon pepper, along with the cooked meatballs, and simmer for 30 more minutes until completion. What Is the Best Meatball Sauce Recipe? What's an Easy Recipe for Italian Spaghetti Sauce? What Are Some of Giada De Laurentiis' Classic Italian Recipes on The Food Network? What Are Some Good White Sauce Pasta Recipes? What Are Some Easy Barbecue Sauce Recipes?